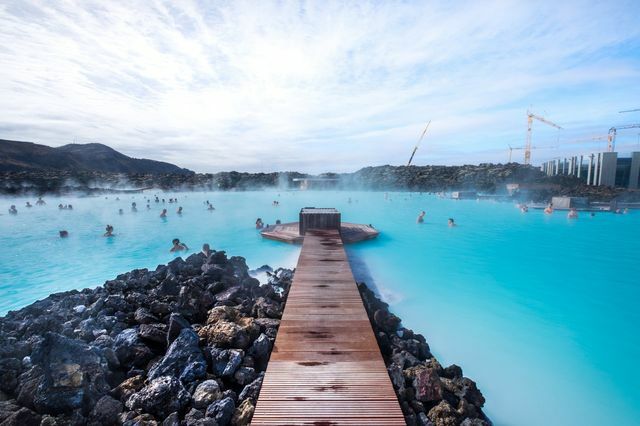 Head to the spa town of Blue Lagoon for an off-the-beaten path honeymoon of relaxation surrounded by Iceland’s stunning scenery. Those with a penchant for an off-the-beaten-path honeymoon should consider going to Blue Lagoon, Iceland. Perfect for nature enthusiasts, history buffs, and spa-lovers, Blue Lagoon and its surroundings offer something for everyone. Blue Lagoon is located 15 minutes from Reykjavik Keflavik Airport and 50 minutes from Reykjavik city, making it a very convenient destination within Iceland. You can enjoy the therapeutic geothermal springs and silica-rich mud used for face and body masks. At night, allow yourselves to be romanced and enchanted by the dazzling spectacle of the Northern Lights. If you wish to explore more of the region, you can scuba dive in glacial lakes, explore mounted on hardy Icelandic ponies, go whale watching, partake in the comforts of Reykjavik, and much more. The rugged beauty and charm of Blue Lagoon will make your honeymoon one that is unique and unforgettable. While the geothermal springs remain hot year round, choose a summer visit for mild weather and clear skies. Winters are, unsurprisingly, brutal with freezing temperatures and North Atlantic gales. Spring and autumn are “in between” with average highs in the high 30s to low 40s. As you might expect, high season and its higher prices will be during the summer. The Lagoon: The area’s namesake attraction - at 100 degrees Fahrenheit, the lagoon’s waters will relax and restore body and mind. Whale Watching: The pristine sub-arctic waters are home to humpback whales, dolphins, and porpoises, but be sure to book ahead, as these trips are popular! Reykjanes Peninsula: Consider arranging a guided tour of this geological wonderland of geysers, active volcanoes, and the meeting point of the North American and Eurasian tectonic plates. The Northern Lights: A wonder of the Arctic latitudes – a night cruise would offer a romantic venue to view nature’s light show. Thingvellir: An Icelandic natural park and UNESCO World Heritage site famous for its natural beauty and the founding of the Icelandic Parliament in 930 AD. Silfra Lake: Located in Thingvellir, the lake offers scuba divers crystal clear water and the chance to swim between two tectonic plates. Golden Circle: A 190-mile loop around southern Iceland offering various tourist activities and sights that can be done in a day or over many. Blue Lagoon on Horseback: Animal lovers will enjoy a leisurely tour on horses whose bloodlines are largely from horses brought by Vikings from Scandinavia in the 900s. Reykjavik: While you’re soaking and touring in the lagoon, don’t neglect to spend some time in the Icelandic capital! Cave Exploration: The volcanic activity around the Blue Lagoon created impressive lava caves that can be explored before taking a relaxing dip in the waters. Skálholt: Once the largest city in Iceland in medieval times, this town is home to Iceland’s most famous cathedral and hosts classical music events.